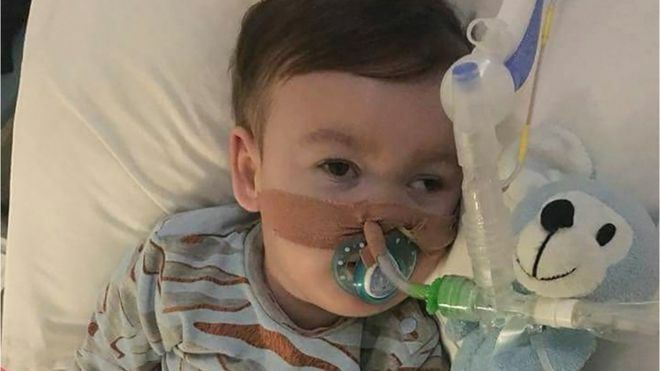 Just a few short days ago, Alfie Evans’ parents lost their final court battle when the British Supreme Court ruled that Alfie’s life support had to be withdrawn. At nine months old, Alfie began having seizures, and after he was checked into the hospital, caught a chest infection. Doctors did not expect Alfie to live, but his condition improved, and he came off the ventilator — but Alfie soon suffered another chest infection, placing him back on life support. Now, Alfie’s father, Tom Evans, has posted a video to Facebook explaining that the hospital removed his ventilator at 9:17 p.m. While it was believed that Alfie would die quickly without his life support, he has instead continued sustaining his own life for over two hours. Evans said that Alfie needed oxygen to help his lungs regain their strength, but the hospital has refused to help him in any way. It is believed that Alfie has encephalomyopathic mitochondrial DNA depletion syndrome, and that he is in a “semi-vegetative” state. His parents insist that there has been no definitive diagnosis, and yet doctors and judges have deemed treatment for Alfie to be futile. Multiple hospitals in other countries were willing to take Alfie and give him treatment, and Evans said he also had several air ambulance companies willing to transport him. Italy even made Alfie a citizen in the hopes that it would convince the British government to allow him to receive treatment there, but to no avail. Part of the issue, judging by the most recent Supreme Court ruling, appears to be that if Alfie survives, he will be severely disabled, and treating him is therefore not worth the effort or expense to keep him alive. Yet Alfie is breathing without his ventilator. Will that matter to the bureaucrats deciding his fate? With Alfie taken off life support, there is no telling what will happen. For now, Alfie’s family and his supporters are praying that Alfie will survive long enough to get him to safety.